We’ll help keep your trees healthy and beautiful. Emerald ash borer infestations have devastated ash tree populations in Minnesota. Act proactively to protect your trees! If EAB is in your area, contact our professional arborists for preventative treatment. Learn more about the signs, symptoms and treatment options emerald ash borer infestations. Dutch elm disease is a fungal infection spread by elm bark beetles. If you notice leaves wilting or turning yellow midsummer, crown dieback or woodpeckers feeding on certain parts of your tree, Dutch elm disease may be present. Root flare injections are a preventative measure to ensure your elm tree is protected. Oak wilt is a fungal disease that is responsible for killing large numbers of oak trees in Minnesota each year. It is spread by insects and through root grafts from infected to healthy trees. Oak wilt disease is more severe and deadly to Red Oaks then the White Oaks and Bur Oaks. 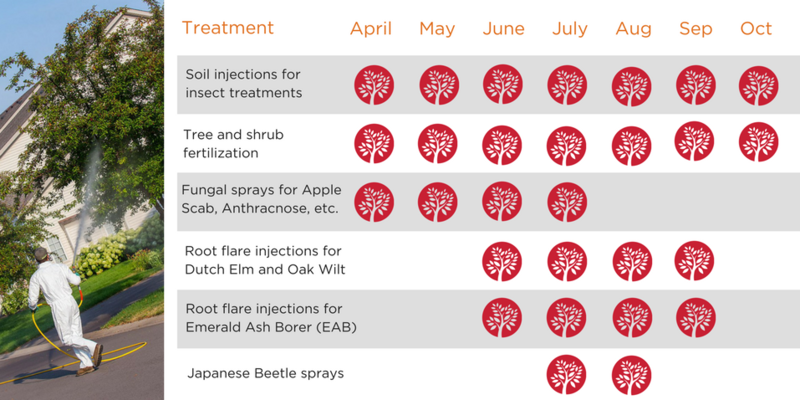 Ensure your oak trees are protected with preventative root flare injections. If you notice spots, discoloration and early leaf loss, your apple trees could be affected by apple scab. This fungal disease infects both the leaves and the fruit of apple trees. Our apple scab fungal sprays are an effective measure to treating and preventing this disease from harming your apple trees. The Japanese beetle is an invasive pest that causes damage by feeding on the leaves and flowers of many types of trees, plants and shrubs that are common in Minnesota. Without treatment, Japanese beetles can cause significant damage to your plants and trees. Learn how to detect Japanese beetle damage and how to protect your plants. Fertilization is vital to keeping your trees and shrubs healthy and beautiful. Well-nourished trees and shrubs are also more resilient against disease and insect infestations. Ask about our deep root fertilization and other fertilization options for trees. Now is the time to schedule your Plant Health Care services. Save your spot on our 2018 schedule and let us do the work to maintain your landscape so you can enjoy the beautiful weather when it's here!